This entry was posted in Air Conditioning and tagged Air Conditioning Repair on August 5, 2014 by coolbreeze. If the time has come for a new air conditioner, it is important to find a unit that truly meets the needs of your home. Use the following tips to ensure that you choose the right size unit to get the most efficiency from your air conditioner. If you want your cooling system to work throughout the house, you have to take measurements to get a better idea of the square footage of your home. These measurements will make it easy to determine what size unit you need. Without these measurements, you might get a unit that is too big, which will waste a lot of energy. If you get a unit that is too small, you will not be able to keep your home as cool as you prefer. 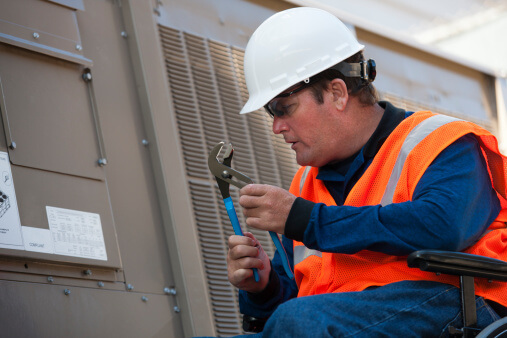 If you are replacing an old air conditioning unit, you can determine what size you need by examining the older one. If your other air conditioner efficiently kept your home cool, you can buy a unit that is the same size. If it never worked properly, though, it might be time to get a different size so you can enjoy a comfortable temperature inside your home. One of the best ways to figure out what size unit you need is to ask the professionals. Call an air conditioner company to come look at your home to determine which size unit will do the best to meet your needs. They can also show you a few different unit options so you can choose the right kind of system for your home. Cool Breeze Comfort Solutions, LLC can help you find the perfect air conditioner for your home. We install high-quality systems that keep your house nice and cool during the brutal summer months in Tucson. To learn more about our installation and repair services, visit us on the Web or call 1-844-550-5300. This entry was posted in Air Conditioning and tagged Air Conditioning, Air Conditioning Maintenance, Air Conditioning Repair, Casa Adobe, Rancho Sin Vacus, Red Rock on August 8, 2011 by coolbreeze. If your air conditioner does not seem to be working as well as it should in your Red Rock home, your natural first reaction is to go out and take a look at the compressor to see if there is anything you can do quickly to correct the problem. Of course, you cannot assess the situation unless you know what you are looking for. For instance, if you see ice forming on the condenser coil or anywhere else on the air conditioning system, you will know you found the likely source of the problem. Ice can form in your air conditioner for a number of reasons. The most common one is that your refrigerant levels are low. Since this refrigerant is contained in a closed system, a deficiency in refrigerant means that there must be a leak somewhere in that system. Only a certified professional can refill your refrigerant and determine where the leaks are in the system to make the necessary repairs. Another reason that ice can develop in your air conditioner is because the air is not flowing fast enough through the system and across the coils. This can happen because of a problem with the fan or because there is an actual physical impediment to the air flow. Regardless of the reason, the ice will form because without adequate air flow the condenser coils will get too cold. These coils are typically kept just above freezing by the constant flow of air across them. When the air passes by them at this temperature, the moisture from the air condenses on the surface of the coil. But because the coil is not quite freezing, the water then runs down into a collection pan. When the coil is too cold, however, the moisture from the air will freeze on the coil before it can run off. This ice actually manages to insulate the coil and keeps it from properly cooling the air or removing any additional moisture. If left unattended, the ice in your central air conditioning system can cause real damage to the unit. Plus, it is not allowing the air conditioner to do its job and cool your house down. So if you notice any amount of ice at all beginning to form on any part of your air conditioner, be sure to call for professional service right away.